Buy response early week and rotation to test key supply to 2.73s. Selling interest at key supply; price discovery lower to 2.65s into Friday’s auction. This week’s auction saw two-sided trade between key near-term supply and demand. 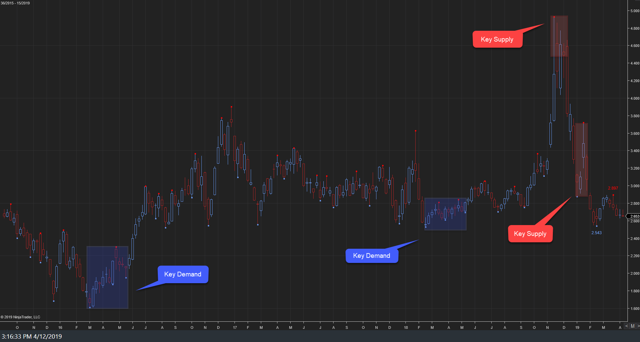 In this article, we examine the significant weekly order flow and market structure developments driving NG's price action. 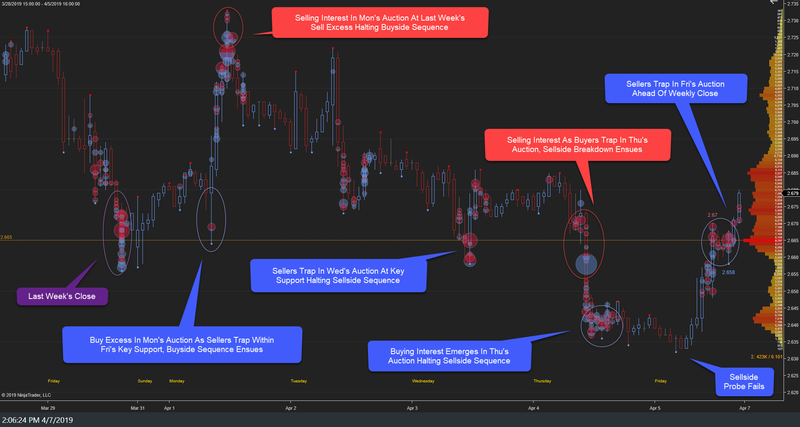 As noted in last week's NG Weekly, our primary inference for this week's auction was for sell-side activity, following last week's minor range extension lower. This probability path did not play out, as early week rotation to key supply was met with selling interest, and late week rotation to key demand was met with buying interest ahead of Friday's close, settling at 2.66s. 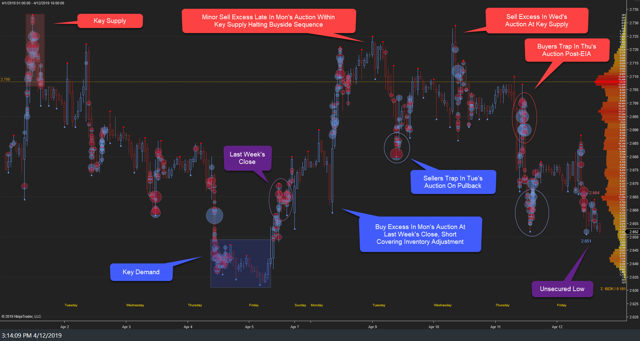 This week's auction saw price discovery higher in Monday's trade as last Friday's late sellers failed to hold the auction. A short covering inventory adjustment then developed through Monday, achieving a stopping point high, 2.73s, within last week's key supply. Self-similar selling interest emerged there, halting the buyside sequence. Price discovery lower then ensued into Tuesday's auction to 2.68s. Sellers trapped there as rotation higher developed into Wednesday's trade as a re-test of Tuesday's high developed. A minor probe higher developed in Wednesday's trade, achieving the weekly stopping point high, 2.73s. Buyers trapped, driving price lower to 2.68s ahead of Wednesday's NY close. Narrow balance developed early in Thursday's auction before a sell-side breakdown developed ahead of the EIA release (+25 bcf v +29 bcf expected). Selling interest emerged, 2.70s-2.69s, upon the EIA release, driving price lower, achieving a stopping point, 2.65s, where minor buy excess formed amidst large buying interest ahead of Thursday's NY close. Retracement rally developed into early Friday's trade, achieving a stopping point, 2.68s, where selling interest emerged amidst a sell excess. Rotation lower ensued, achieving the weekly stopping point low, 2.65s, probing Thursday's low. Buying interest emerged there ahead of Friday's close, settling at 2.66s. This week's primary expectation of price discovery lower did not develop, despite a sell-side sequence through the back half of the week toward key demand. This week's auction formed a structural unsecured low, 2.65s. Looking ahead, the near-term bias (2-4 week) remains sell-side, as the corrective phase from 2.90s is potentially amidst its third wave. The sell-side rejection early week at key supply, 2.70s-2.73s, continues to support the sell-side premise. Focus into next week centers upon market response to key demand, 2.65s-2.63s. Buy-side failure to hold the auction there will target the key demand cluster below, 2.62s-2.56s. Alternatively, sell-side failure in this area targets the key supply clusters overhead, 2.71s-2.73s/2.76s-2.79s, respectively. In the intermediate-term (3-6 month) context, further price discovery lower into major key demand, 2.20s-1.50s, remains possible barring sell-side failure within supply overhead, 2.87s-3.72s. 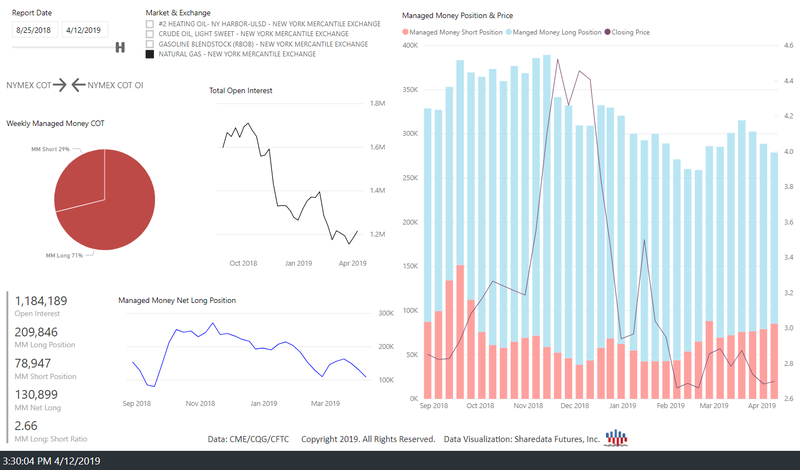 It is worth noting that despite the approximately 48% decline from the November 2018 high, no material Managed Money (MM) short posture is yet present. MM short trend may have begun a trend higher in February. It is only with materially larger MM short posture that the market has seen structural lows develop in recent years. This development occurs amidst continued declining market leverage (Open Interest). Based on recent years' data, current MM posture is not consistent with MM posture that typically contributes to the formation of a structural low. The larger key supply, 2.87s-3.72s, and market response there will remain key.